With the recent December 2004 tsunami that wreaked death and destruction in Indonesia, Sri Lanka, and beyond (view an animation of the tsunami by the National Oceanic and Atmospheric Administration (NOAA) - Apple QuickTime required), many might wonder about tsunamis occurring in the Atlantic Ocean and striking the east coast of the United States; most notably, Maine. Although most people don't put "tsunami" and "Atlantic Ocean" in the same sentence, history and geology tell us that the Atlantic Ocean does experience tsunami activity, albeit on a less catastrophic scale. However, although highly debated in the scientific realm, one of the world's "ticking time bombs" that may trigger a tsunami is located in the Atlantic Ocean! This Geologic Site of the Month provides background information and characteristics of tsunamis, some of their history in the Atlantic Ocean, and several possible locations where tsunamis could be triggered and impact the east coast of the United States in the future. A tsunami is a wave produced by a disturbance that displaces a large mass of water - usually a result of geologic activities such as earthquakes, volcanic eruptions, underwater landslides, or in rare geologic cases, meteor strikes. After such a disturbance, displaced water travels outward from its site of origin as a series of unusually large waves at great speeds (Komar, 1996). Tsunamis are often mistakenly referred to as tidal waves, though tides play no role in their formation. The term tsunami originates from the Japanese words tsu (harbor) and nami (wave). The term was created by fishermen who returned from fishing and found everything devastated in the harbor though they didn't see or notice the wave in the open water (Wikipedia, 2004). where g is gravitational acceleration (9.81 m/s). The rate at which a tsunami loses its energy is inversely proportional to its wavelength. Thus, a tsunami travelling through water depths of 4,000 meters would be moving at approximately 200 m/s, or close to 450 miles per hour! At the same time, because of its very large wavelength, it is losing very little energy. In deep water, a tsunami can pass underneath a ship undetected. This is because its wavelength is on the order of several kilometers. However, when a tsunami reaches the continental shelf and begins to shoal, it will slow and increase in height. Figure 1. Diagram of the characteristics of an ocean wave. The wave height (H) is the distance from the crest of the wave to its trough. Wavelength (L) is the distance between subsequent crests (in this case, A and B), while period (T) is the time it takes for subsequent crests to pass the same point. The majority of wind-driven waves have periods of less than 20 seconds and wavelengths of several hundred meters. Tsunamis can have periods upwards of an hour and wavelengths of several kilometers. 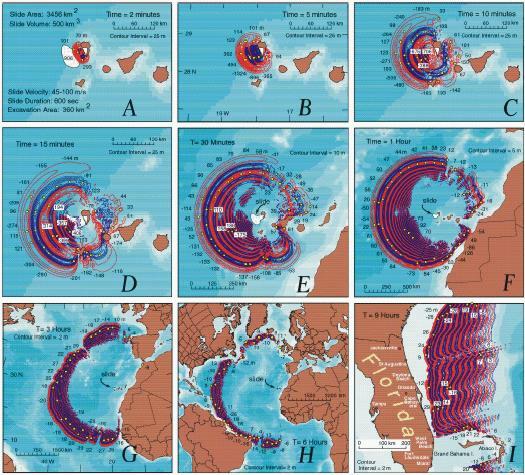 Figure 2 shows the generation of a tsunami from an earthquake and how it travels across an ocean. In this situation, an earthquake results from a sudden shift in the subduction zone between continental and oceanic crusts (2a). This abrupt motion displaces the overlying water upwards and downwards, initiating a tsunami. 2b shows the initial tsunami split into a deep ocean (distant) and coastal (local) tsunami, headed in opposite directions. Because the distant tsunami is traveling through deeper water, it is moving much faster. Figure 2c shows amplification of the local tsunami as it passes over the continental slope - this is due to the tsunami encountering shallower water. As it continues towards land, should the trough of the tsunami reach a coastline first, the water level along the coastline appears to fall rapidly, as if the tide is ebbing. This process, called drawdown, is due to the tsunami shoaling, increasing in height, and drawing water seaward. Figure 2. A) An earthquake results from plate shifting at a subduction zone (oceanic plate being subducted under continental plate). Displaced water forms a tsunami. B) Tsunami separates into two distinct waves - local (to right) and distant (to deep water). C) As local wave encounters continental slope, it gains amplitude (height) and slows down. The trough of the wave, if it encounters the coast first, will cause a drop in water level (drawdown). Note the distant wave traveled much farther from the point of origin since it is moving faster in deep water (adapted from USGS). Note: Wave heights and slopes are exaggerated in comparison to water depths. Figure 3 summarizes how the characteristics of a tsunami change as the wave propagates through deep water towards the coastline. Figure 3. 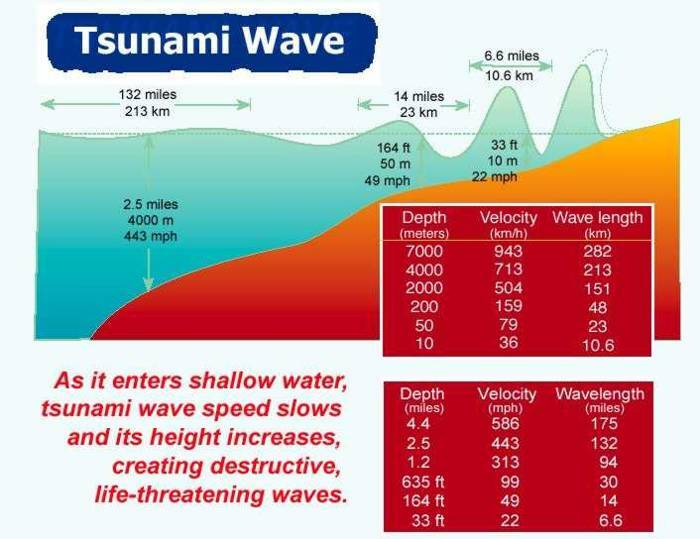 Image showing the characteristics of a tsunami as it passes through the mid-ocean and approaches a coastline. Note the high speed (>400 mph in 4000 m depth), large wavelength (213 km), and low amplitude (usually a meter or less) of the wave as it passes through deep water. Because of their large wavelength and deep water (thus low amplitude), most tsunamis pass in the mid-ocean unnoticed. However, as the wave encounters shallower water, its velocity slows, wavelength decreases, and its amplitude increases (image from GlobalSecurity.org). When a tsunami reaches a coastline, several key factors influence its destructive force. These are the height of the tsunami, its runup height, and its runup distance. Its height is simply the excess height of the tsunami wave (crest) over the normal ocean level as it passes a given point. Its runup distance is the distance from the normal tide line, or shoreline, at the time of the tsunami's arrival to its maximum extent inland. The runup height is the elevation of the point of maximum runup above the normal ocean surface at the time of the tsunami (Figure 4). Figure 4. When the tsunami encounters the coastline, it breaks, surging water forward. Note the runup distance and height in relation to the normal sea level (adapted from USGS). The effect a tsunami has on a coastline also depends on the the origin of the tsunami, distance from its point of origin, its size, and the slope and configuration of the bathymetry and coast that the tsunami is approaching. Because of the long period of tsunamis, they can bend around obstacles such as islands, bays, and gulfs. They typically arrive at a coast in the form of suddenly decreasing then rapidly increasing water levels, bore-like waves (similar to a tidal bore), several large breaking waves, or a combination. Tsunamis rarely arrive as a giant breaking wave, as is most commonly depicted, but generally arrive as forceful and rapid increases in water level that violently flood the coastline. How big can tsunami get? In general, most tsunamis range from several centimeters to tens of meters. Depending on the distance from the point of origin and various other factors, a tsunami may only appear as brief, discrete elevations of the water level, noted only by tide gauges. On the other extreme is the mega-tsunami, which can reach heights of several hundred meters. The largest recorded tsunami reached an astounding 516 meters (1,720 feet) of runup! This tsunami struck Lituyah Bay, Alaska in July, 1958, the result of an 8.3 magnitude earthquake at the headland of the bay that sent the gigantic wave roaring into the small enclosed bay, tearing up the sides of the bay. An excellent summary and analysis of this event, with pictures, is provided at the Dr. George Pararas-Carayannis website. On the Hawaiian island of Lanai geologists have located three stacked sedimentary deposits from the runup of a giant wave train that may have originated from a nearby submarine landslide about 105,000 years ago (Moore and Moore, 1988). The Lanai deposits, called the Hulopoe Gravel, are found up to an elevation of 375 m (1230 feet) but are more widespread below 100 m (330 feet) inland of the south shore from Kaluakoi to Hulope Bays. This may be the highest known wave runup due to a submarine landslide. What was the most devastating recorded tsunami? In terms of human loss, the most recent December 26, 2004 tsunami in Indonesia, which killed over 150,000 people (at the time of this writing), is by far the worst recorded tsunami. A huge tsunami on the order of 30 meters resulted from the explosion of the volcano Krakatoa (in Indonesia) in August 1883, killing over 36,000; while a 1755 earthquake off the coast of Portugal triggered a tsunami that killed over 60,000 in Portugal, Africa, and Spain combined. Although it is under scientific debate, some scientists believe that the most devastating tsunami in terms of global size, may have occurred as a result of a meteor that is believed to have struck the earth near the Yucutan Peninsula some 65 million years ago. Most tsunamis occur in the Pacific Ocean since it is the hotbed of continental and oceanic plate activity and volcanism. 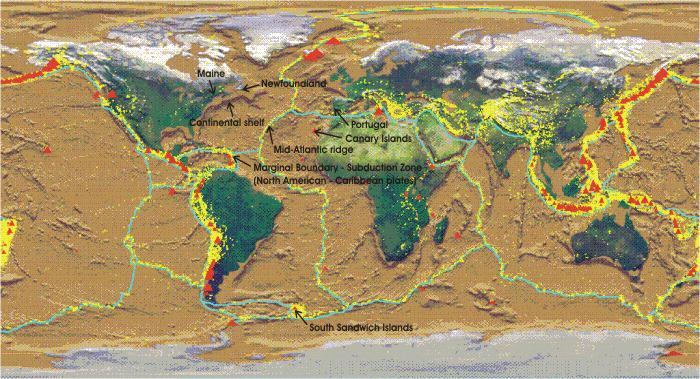 Figure 5 shows the locations of plate margins, recorded earthquakes, and active volcanoes around the world. Figure 5. Map of the world showing active plate boundaries (blue lines), recorded seismic activity (yellow dots), and active volcanoes (red triangles). Note the general lack of strong seismic volcanic and seismic activity in the northern Atlantic Ocean. The mid-Atlantic ridge is a passive boundary, a spreading center, which is spreading at a rate of about 25 mm/yr. The only active subduction zones are at the Puerto Rico Trench (Caribbean Plate and North American Plate), and at the South Sandwich Islands (image adapted from San Diego State University and NASA). Note the dominance of both seismically active and volcanic regions in the Pacific Ocean. By contrast, the Atlantic Ocean is home to much less seismic and volcanic activity than the Pacific, which is why the Atlantic has fewer tsunamis. In the Atlantic Ocean, the Mid-Atlantic Ridge is a spreading center and the east coast of the United States is a passive margin; that is, no plates are colliding or sliding against each other as in the Pacific Ocean. The majority of the Atlantic Ocean's active areas in terms of both seismic and volcanic activity is concentrated near the Caribbean Islands, and at the Scotia island arc chain (South Sandwich Islands) near Antarctica. In the Caribbean, just north of Puerto Rico lies the Puerto Rico Trench, the deepest point in the Atlantic Ocean. This is where the North American Plate (moving west) meets the Caribbean Plate (moving east), resulting in relatively active subduction zones and volcanic island-arc systems (Figure 6). The Antilles subduction zone is just southeast of this. Similarly, the South Sandwich Islands in the southern Atlantic also mark an active subduction zone. Here, the Atlantic Plate is being subducted below the Antarctic Plate, resulting in the formation of the volcanic South Sandwich Islands. Since these are well south in the southern Atlantic, they will not be discussed further. Figure 6. 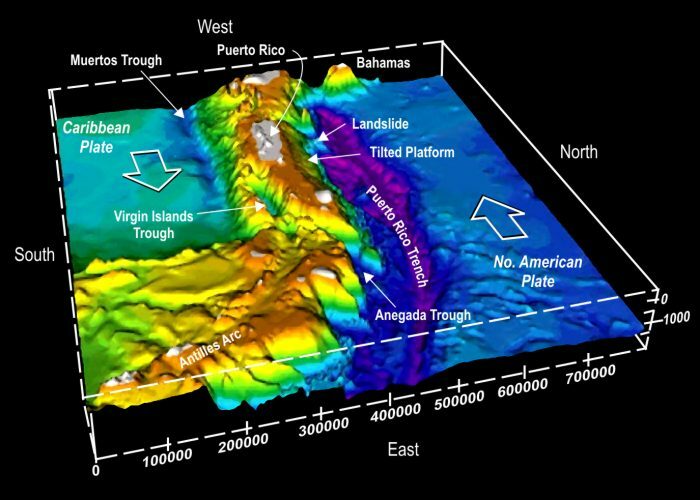 Detailed 3-D interpolated image showing the interaction of the Caribbean and North American Plates and the location of the Puerto Rico Trench. The U.S. Virgin Islands and Lesser Antilles are located to the southeast of Puerto Rico (Image courtesy of the U.S. Geological Survey). The majority of tsunamis in the Atlantic Ocean and Caribbean Sea were triggered by either seismic (earthquake) activity or the result of volcanic eruption. The majority of these resulted in localized damage and death, but nothing on a regionally catastrophic scale outside of the Caribbean. There are many confirmed and unconfirmed tsunami events that resulted in localized flooding, especially in the Caribbean Islands. Lander (1999) determined that there have been over 50 recorded tsunamis, varying in size, in the Caribbean Islands since the year 1530. Zahibo and others (2003a) evaluated past tsunami events and projected the impacts of future potential tsunami activity in the Caribbean. The Atlantic Ocean, however, has also been home to several devastating tsunamis, the most notable being the 1755 tsunami that hit Portugal, Spain, and northern Africa. Only the larger of these events are summarized below. At the end of each summary are links to more information on each event. 1755 Lisbon, Portugal - A near 9.0 magnitude earthquake occurred 200 km from the Portugese coast. This earthquake was generated by convergence between the African and Eurasian Plates at a ridge known as Gorringe Bank. The earthquake itself destroyed much of the Portugese City of Lisbon. Several minutes after the earthquake, a minimum of 3 tsunamis, around 10 meters in height, ravaged the city. An artist's rendering of the destruction of the earthquake and tsunami is provided at the Lisbon earthquake site. The waves also hit Spain and North Africa, and did damage in the Azores, Madiera, and the Canary Islands. Its effects were felt as far west as the Caribbean Islands, where 3-5 meter waves were reported, and as far north as Ireland. 1867 U.S. Virgin Islands - A 7.5 magnitude earthquake occurred in the Aneganda Trough, located between the U.S. Virgin Islands of St. Croix and St. Thomas. The earthquake triggered a series of waves on the order of several meters to over 12 meters that impacted the surrounding Caribbean islands. An 18-meter wave was reported on the island of Guadeloupe, however, this report was considered an exaggeration since it exceeded the maximum wave heights reported closest to the epicenter of the earthquake. However, a 10-meter wave was recorded for two locations on Guadeloupe. A study of the event, including simulations, is provided by Zahibo and others (2003b, PDF). 1918 Puerto Rico - A 7.5 magnitude earthquake occurred 15 km off the northwest coast of the island within the Puerto Rican Trench. The deepest point in the Atlantic, the trench marks the location where the North American plate is being subducted beneath the Caribbean Plate. It produced waves and runup on the order of 4-6 m that killed 40 people on the island (Mercado and McCann, 1998). The effects of the tsunami were recorded as surges in water levels at a tide gauge in Atlantic City, NJ. 1929 Grand Banks, Newfoundland, Canada - This tsunami hit closest to the state of Maine. A 7.2 magnitude earthquake occurred at the mouth of the Laurentian Channel south of the Burin Peninsula on the south coast of Newfoundland, triggering an underwater landslide that caused a tsunami (Ruffman, 2001). The earthquake itself was felt as far as Boston, Montreal, and New York (Figure 7). Figure 7. Limits of the areas that felt effects of the 1929 earthquake that spawned a tsunami that hit Newfoundland. Intensities are from the Rossi-Forel scale and only indicate effects of earthquake shaking, not the tsunami (from Natural Resources Canada). The underwater slump, however, is deemed by some to be the trigger of the tsunami (Bornhold and others, 2003). A resulting tsunami, including 3 waves ranging between 2-7 m, struck the coast of Newfoundland about 2.5 hours after the earthquake, and it was recorded that the tsunami reached runup heights of 27 m at the heads of the long narrow bays of the Burin Peninsula (Ruffman, 1996). 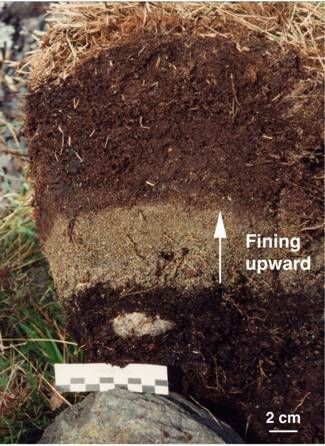 Tuttle and others (2004) recently found onshore tsunami deposits at several locations along the coast of the Burin Peninsula. From field measurements made at one of these locations, it has been determined that the tsunami runup extended 480 m inland to an elevation of more than 8.5 m above sea level (Figure 8). The number of people killed varies based on reports, but ranged from 25-50. Figure 8. Photographs of 1929 tsunami deposits at Taylor's Bay on Newfoundland's southern coast. Photograph (above) shows three sandy units deposited by consecutive waves. Photograph (right) shows fining upward of a single sandy unit probably related to the decrease in velocity of the tsunami (from Tuttle and others, 2004). Click on image for enlarged view. Figure 9. Image of tsunami travel times for the 1929 tsunami that occurred off of Newfoundland. 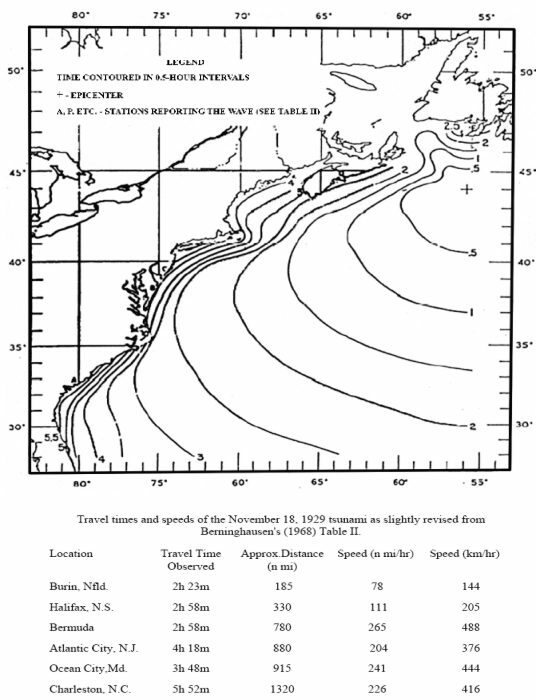 The table below the figure provides information on travel times, the approximate distance traveled, and speed of the wave for various locations that recorded the wave along the eastern United States coastline. (Ruffman, 1996). Only small tsunami events have been recorded in Maine. According to the National Weather Service, events were recorded in 1872 and 1926. In 1872, small waves (less than 50 cm) were recorded by tide gauges in Penobscot Bay, though the source of the waves is unknown. A larger wave hit Mt. Desert Island in 1926. This wave reportedly reached 10 feet and suddenly flooded Bass Harbor. There were no injuries reported. It is thought that these events precipitated from small earthquakes in the Atlantic Ocean. Strangely, there are no records in Maine of the 1929 tsunami that hit Newfoundland (mentioned above). The Caribbean is home to some of the most geologically active areas outside of the Pacific Ocean. Similar to the Indonesian islands, this area has a subduction zone that is located just north of the island of Puerto Rico, where the North American plate is being subducted beneath the Caribbean Plate at the Puerto Rico Trench. This area includes other troughs and active areas of plate tectonics that have produced numerous earthquakes, submarine landslides, volcanic eruptions, and resulting tsunami activity. A detailed 3-D shaded interpolated image of the Caribbean seafloor (Figure 10), and specifically the Puerto Rico Trench and vicinity (Figure 6), show this tectonically and volcanically active area. Figure 10. 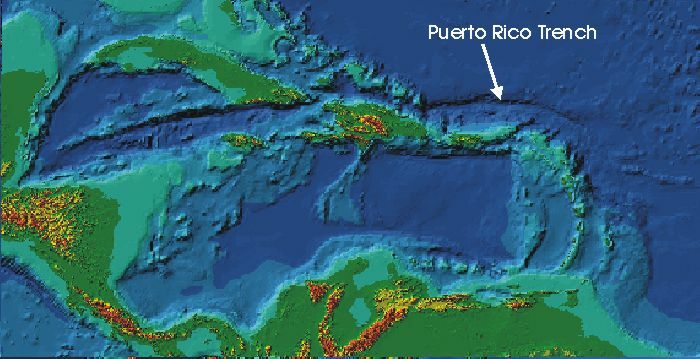 3-D bathymetry of the Caribbean Sea showing the location of the Puerto Rico Trench. 30-sec digital elevation data from GLOBE data set and bathymetry model is interpolated 5-min data from ETOPO5 data set (image courtesy of ). Many of the islands of the Lesser Antilles are volcanically active. Of these, Montserrat has been one of the most active. The Soufriere Hills volcano, located in the southern portion of the island, erupted recently in 1997, 1999, and 2003 - all of these eruptions resulted in the formation of tsunamis due to failures of the volcano's flanks. The tsunamis caused only localized destruction. See the Dr. George Pararas-Carayannis website for more information on volcanically active islands in the Caribbean that have caused tsunamis. Although this is the most seismically and volcanically active area in the Atlantic Ocean, future events would probably result in localized impacts within the Caribbean Sea, similar to recorded past events (1867, 1918 earthquakes and tsunamis) and it is unlikely that any volcanic eruptions or earthquakes would trigger a tsunami that would have a major impact on the New England area. Although the east coast of the United States is generally much less likely to be affected by a tsunami than the west coast, tsunami threats do exist. 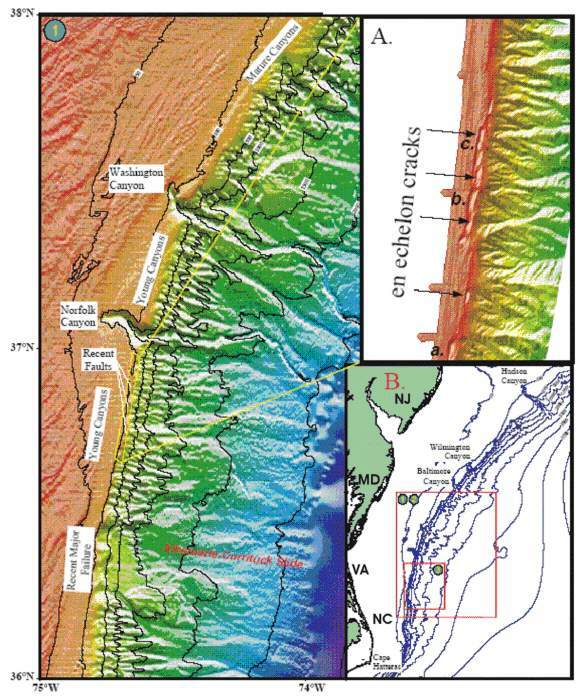 Closer to home, Driscoll and others (2000) found evidence of a large submarine landslide off of the coasts of Virginia and North Carolina. 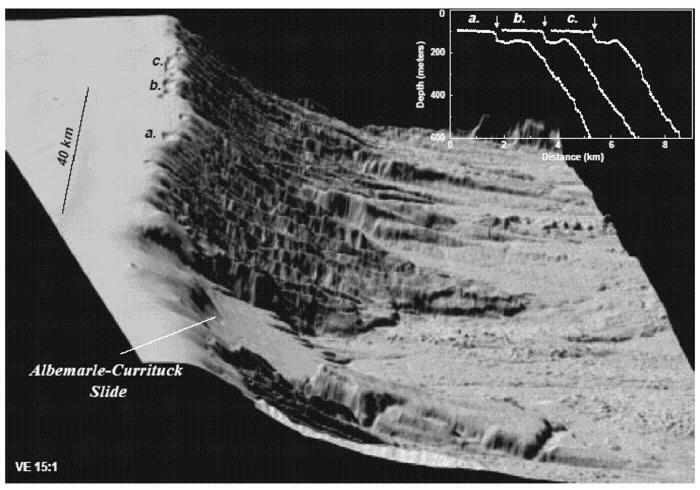 This slide, called the Albemarle-Currituck Slide, occurred approximately 18,000 years ago, in which over 33 cubic miles of material slid seaward from the edge of the continental shelf, most likely causing a tsunami (Figure 11). A three-dimensional image of the slide is shown in Figure 12. Investigation of the outer continental shelf just north of the slide and the slide's structure found that cracks in the continental shelf exist (marked as a, b and c in Figures 11 and 12, from Driscoll and others, (2000). These cracks may indicate a progression towards slope failure and the potential for another submarine landslide to occur that could trigger a tsunami on the order of a few to several meters in height, similar to a storm surge resulting from a Category 3 or 4 hurricane. Figure 11. Images showing the location of the Albemarle-Currituck slide (bottom right inset) off of the NC/VA coastlines. The larger figure (left-hand side) shows the bathymetry in the vicinity of the slide site and surrounding submarine canyons. The upper right inset shows a close-up of the en-echelon cracks (faults) that have developed at the top of the continental shelf marked a, b, and c (south to north). These cracks could lead to future slope failure and the formation of a slide (images from Driscoll and others, 2000). Figure 12. Side-scan sonar imagery of the Albemarle-Currituck slide site and submarine canyons to the north. The faults (cracks) in the upper slope marked a, b, and c correspond with those from Figure 9 (from Driscoll and others, 2000). The Canary Islands are a volcanic island-arc chain located in the eastern Atlantic Ocean just west of the Moroccan coastline (Figure 13). Figure 13. The Canary Islands are located approximately 60 miles west of the coast of Morocco. 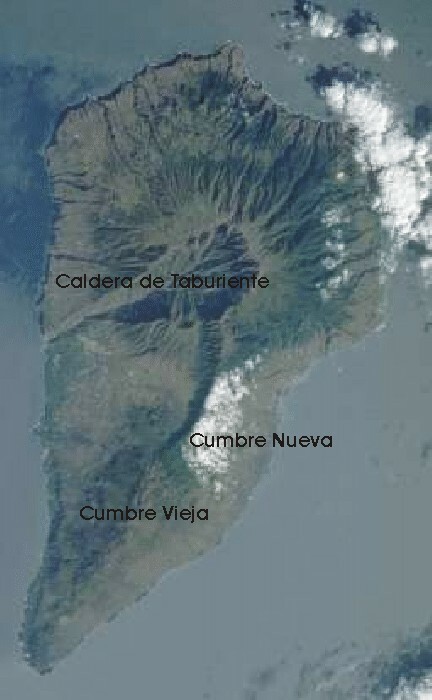 The island of La Palma, home of the Cumbre Vieja volcano, is one of the westernmost islands (image from GraphicMaps.com). La Palma is the western-most and the youngest of the Canary Islands, and is volcanically active with 3 large volcanoes (Figure 14). It is home to the most active volcano of the Canaries, Cumbre Vieja, which last erupted in 1949 and 1971. It is here that some researchers point to as a possible ticking time bomb for large tsunami creation in the Atlantic Ocean. Figure 14. Space shuttle image of La Palma and the Cumbre Vieja volcano (Space shuttle photo STS074-085-092). Based on a study of past landslide deposits and existing geology of the volcano, Ward and Day (2001) suggest that the west flank of the Cumbre Vieja volcano may experience catastrophic failure during a future eruption, resulting in a landslide of a block of 15-20 km in width and 15-25 km long into the depths of the Atlantic Ocean. Computer modeling suggests that such an event could trigger a massive mega-tsunami hundreds of meter in height that would propagate to the north, south, and west. Within 9 hours, an estimated 10-25 meter wave could reach the US east coast (Figure 15, from Ward and Day (2001). Figure 15. Evolution of the La Palma landslide tsunami from 2 minutes (A, upper left) to 9 hours (I, lower right). Red and blue contours cover elevated and depressed regions of the ocean respectively and the yellow dots and numbers sample the wave height, positive or negative, in meters. Note the strong influence of dispersion in spreading out an original impulse into a long series of waves of decreasing wavelength. See also that the peak amplitudes generally do not coincide with the first wave. Even after crossing the Atlantic, a lateral collapse of Cumbre Vieja volcano could impose a great sequence of waves of 10-25 m height on the shores of the Americas (from Ward and Day, 2001). While the active volcano of Cumbre Vieja on Las Palma is expected to erupt again, it will not send a large part of the island into the ocean, though small landslides may occur. No such event - a mega tsunami - has occurred in either the Atlantic or Pacific oceans in recorded history. The colossal collapses of Krakatau or Santorin (the two most similar known happenings) generated catastrophic waves in the immediate area but hazardous waves did not propagate to distant shores. Carefully performed numerical and experimental model experiments on such events and of the postulated Las Palma event verify that the relatively short waves from these small, though intense, occurrences do not travel as do tsunami waves from a major earthquake. The Pacific Ocean is monitored for tsunamis that may impact Hawaii, Alaska, California, Oregon, and Washington extensively by the National Oceanic and Atmospheric Administration. NOAA's DART program (Deep-ocean Assessment and Reporting Tsunamis) includes an array of seismic networks, tsunami detection buoys, and tidal gauges (Figure 16). The DART program is part of the U.S. National Tsunami Hazard Mitigation Program. The NOAA National Weather Service also runs the West Coast/Alaska Tsunami Warning Center, in addition to the Pacific Tsunami Warning Center, and is part of the International Tsunami Information Center based in Hawaii. Figure 16. 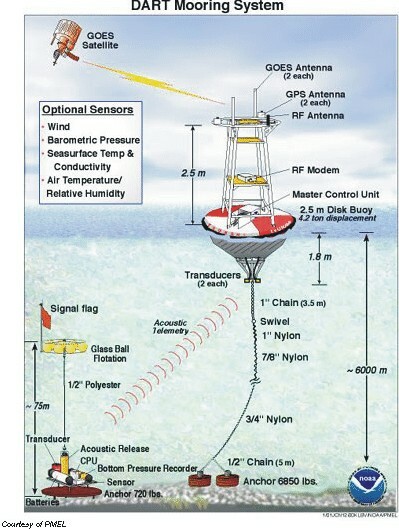 Image of NOAA DART (Deep-ocean Assessment and Reporting Tsunamis) program tsunami mooring system. This system is comprised of two parts: the bottom pressure recorder (BPR) and the surface buoy with related electronics. The BPR monitors water pressure with a resolution of approximately 1 mm sea water with 15 second averaged samples. Data is transmitted from the buoy via an acoustic modem, and data is transmitted from the buoy via the GOES Data Collection System. If two 15-second water level values exceed the predicted values, the system will go into the Tsunami Response Mode. Data will be transmitted for a minimum of 3 hours. However, there is no such monitoring program in the Atlantic. Although no tsunami-specific monitoring program exists, the United States National Seismograph Network, operated by the U.S. Geological Survey, is part of a Global Seismic Network that monitors seismic (earthquake) activity around the world. These networks are able to detect seismic events that are capable of resulting in a tsunami. Soon after an earthquake occurs, seismic activity is recorded by the seismographs, and beamed to a satellite and to the USNSN home base in Colorado, where it is analyzed and warnings (if needed) are issued. So should we be worried in Maine? As reported recently in numerous papers around New England (Boston Globe), although the possibility of tsunami impacts in Maine does exist from earthquakes and submarine landslides that occur in the Atlantic Ocean, the chances of a catastrophic event are minimal. Unlike the Pacific Ocean, which is full of convergent tectonic plate margins and volcanic islands, the closest tectonic boundary to the east coast of the U.S. is the Mid-Atlantic Ridge. This ridge is a spreading center, where oceanic crust is being generated and tectonic plates (including the North American Plate) are spreading apart at a rate that a fingernail grows (25 mm/year; Smith and others, 2004). Most of the spreading motion in the Mid-Atlantic Ridge does not involve large vertical movements (they are more horizontal) that generate water displacements that lead to tsunamis. Although there are numerous faults and earthquakes are quite common along the Mid-Atlantic Ridge (Figure 17; Smith and others, 2002, 2004; PEML, 2003), severe tsunamis are less likely to form there than along convergent margins. In the Caribbean Sea between the Americas there is a convergent plate boundary and a region with a higher probability of generating earthquakes that could produce tsunamis (Ten Brink and others, 2004). Tsunamis could travel to the Gulf of Maine from the Caribbean, or from the Mid-Atlantic Ridge, or from the Canary Islands. Figure 17. Image of the northern Atlantic Ocean showing the Mid-Atlantic Ridge and recorded seismic (earthquake) event locations. 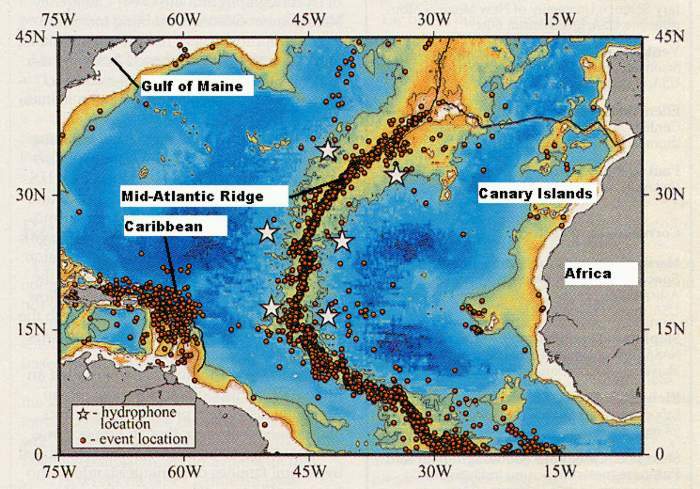 From 1999-2002, approximately 8,000 earthquakes were recorded, mostly along the Mid-Atlantic Ridge and along the subduction zone in the Caribbean (image modified from Smith and others, 2004). Let us assume, however, that a 3-meter tsunami, as modeled by Mader (2001) arrives at the Gulf of Maine, triggered by the eruption and collapse of the western flank of Cumbre Vieja in the Canary Islands. The Gulf of Maine is a relatively shallow water body, with an average depth of about 150 meters (492 feet) and a maximum depth of 377 meters (1,237 feet) at the Northeast Channel (Figure 18). Georges Bank, which rises to shallow depths of only 4 meters (13 feet), would most likely cause the tsunami to (a) partially be reflected back out to sea and (b) break in the form of extremely large surf. As a rule of thumb, a shallow water wave breaks when it reaches a depth that is equivalent to about 1.5 times its height. For both reasons, some of the tsunami wave energy would be dissipated far from the Maine coast. However, the tsunami could reform on the landward side of the bank and continue to spread throughout the inner Gulf of Maine. This secondary wave would be smaller in size. With the presence of the relatively shallow Georges Bank offshore, Maine remains protected from the full force of an Atlantic Ocean tsunami. Figure 18. 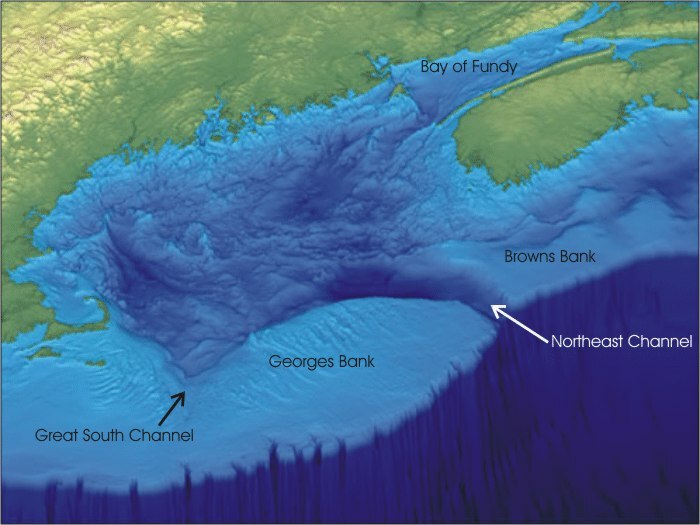 Gulf of Maine bathymetry exaggerated 75 times, showing Georges and Browns Bank and the Northeast Channel. Georges Bank has depths as shallow as 13 feet, which would cause most tsunami waves to break, though tsunami energy could pass through the Northeast Channel and radiate out towards the coastline and up the Bay of Fundy (image modified from GoMOOS). Tsunami wave energy probably could enter the Gulf of Maine (perhaps without breaking) directly through the Northeast Channel. It could then be expected to spread radially through diffraction into the inner Gulf of Maine. The crest of this wave would likely be oriented differently from the one that passed across Georges Bank. Additional wave fronts might pass through the shallower Great South Channel (east of Cape Cod) and radiate through the Gulf of Maine from yet a third direction. The combined results of (a) wave breaking and reforming over Georges Bank Basin and (b) diffraction through the two channels, will likely result in a series of smaller tsunami waves that approach the Maine coast from different directions and with different arrival times. As in other locations, the first sign of the approaching large-period wave may be for the water level to fall to unusually low levels before rushing in across the shoreline. Tidal range would play a role in the severity of impacts of a tsunami wave. The tide ranges anywhere from about 9 feet in Kittery to near 20 feet in Eastport. If the tide is low, impacts would be less than if the tide is high. If the tide is high, near the maximum "spring tide" (levels enhanced by a new or full moon), the impacts could be worse simply due to elevated water levels over which the tsunami would pass as it arrives ashore. Because of the natural complexity of Maine's coast, effects would be different from place to place. Along the outer rocky coast the effect would be similar to that of northeast storm waves at high tide that erode the soil horizon along the shore and damage piers and wharves. Other effects would be beach erosion, dune and seawall overwash, with coastal flooding and structural damage to low-lying properties. Along some inner bays and estuaries that narrow in width inland, flooding would be amplified as the wave is confined to a more narrow space. In 1976 a storm surge traveled up the Penobscot River and rapidly flooded downtown Bangor with 10 feet of water (Morrill and others, 1979). The February 1976 flooding is the closest analog of a tsunami the Maine coast has experienced in the last century. A true tsunami would have more widespread impacts than a severe coastal storm, although the probability of a tsunami in any year is much lower. It is possible that a tsunami wave could exacerbate the naturally high tides within the Bay of Fundy. The Bay experiences a natural tidal funneling effect (and sloshing effect, known as a seiche) which causes tidal range of over 10-15 meters. The seiche has a period of 13 hours (780 minutes), which corresponds almost exactly with the lunar tidal cycle of the Atlantic (745 minutes), creating resonance conditions that the tidal flow amplifies, causing the highest tides in the world. The worst-case scenario would be if the tsunami's period was a subharmonic of the seiche and natural lunar tide. This would probably result in seiching within the entire Gulf of Maine, causing an amplification of Gulf of Maine tides and much larger tidal bores in the Bay of Fundy. But realistically, Klaus Jacob of the Lamont-Doherty Earth Observatory in New York estimated that a tsunami "has a lower than 1 in 1000 chance of occurring in eastern North America in any given year" (Boston Globe, 2004). As one scientist from the University of Texas said about the likelihood of a tsunami hitting New England, "I'd worry a lot more about hurricanes than tsunamis" (Boston Globe, 2004). Baptista, M.A., Miranda, J.M., Chierici, F., and Zitellini, N., 2003, New study of the 1755 earthquake source based on multi-channel seismic survey data and tsunami modeling (PDF): Natural Hazards and Earth System Sciences (2003) v. 3, p. 333-340. Bornhold, B.D., Fine, I.V., Rabinovich, A.B., Thomson, R.E., and Kulikov, E.A., 2003, The Grand Banks Landslide generated tsunami of November 18, 1929: Analysis and Numerical Modeling: European Geophysical Society - Geophysical Research Abstracts, v. 5, p. 17-75. Boston Globe, 2004, N.E. is not immune, scientists warn. December 28, 2004. Driscoll, N.W., Weissel, J.K., and Goff, J.A., 2000, Potential for large-scale submarine slope failure and tsunami generation along the US mid-Atlantic Coast. Geology: May 2000, v. 28, no. 5, p. 407-410. Komar, P.D., 1996, Beach Processes and Sedimentation, Second Edition: Prentice Hall, Upper Saddle River, New Jersey. Lander, J.F., 1999, Caribbean Tsunamis: An Initial History. Mader, C.L., 2001, Modeling the La Palma Landslide Tsunami (PDF): Science of Tsunami Hazards, v. 19, no. 3., p. 150-170. Mercado, A., and McCann, W., 1998, Numerical Simulation of the 1918 Puerto Rico Tsunami (PDF): Natural Hazards, v. 18, p. 57-76. Moore, G.W. and Moore, J.G., 1988, Large-scale bedforms in boulder gravel produced by giant waves in Hawaii, in Clifton, H.E. (ed. ), Sedimentologic consequences of convulsive geologic events: Geological Society of America, Special Paper 229, Boulder, Colorado, p. 101-110. Morrill, R.A., Chin, E.H., and Richardson, W.S., 1979, Maine Coastal Storm and Flood of February 2, 1976: U.S. Geological Survey and the National Oceanic and Atmospheric Administration, Professional Paper 1087, 20 p.
Ruffman, A., 1997, Tsunami Runup Mapping as an Emergency Preparedness Planning Tool: The 1929 Tsunami In St. Lawrence, Newfoundland - Volume 1 (PDF): Office of Critical Infrastructure Protection and Emergency Preparedness, Government of Canada, Catalogue No. : D82-41/1-1996E. 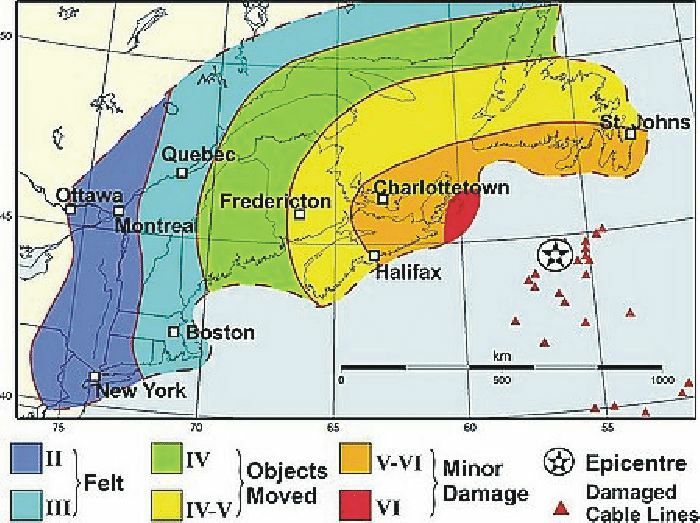 Ruffman, A., 2001, The November 18, 1929 offshore earthquake, slump, and tsunami: Canada's most tragic historic seismic event: Geological Association of Canada - Mineralogical Association of Canada, 2001 Joint Annual Meeting, Memorial University, St. John's, Newfoundland, Canada. Smith, D.K., Tolstoy, M., Fox, C.G., Bhonenstiehl, D.R., Matsumoto, H., and Fowler, M., 2002, Hydroacoustic monitoring of seismicity at the slow-spreading Mid-Atlantic Ridge (PDF), Geophysical Research Letters, v. 29, 2002. Smith, D. K., R.P., Dziak, Matsumoto, H., Fox, C. G., and Tolstoy, M., 2004, Autonomous hydrophone array monitors seismic activity at northern Mid-Atlantic Ridge: EOS, Transactions, American Geophysical Union, v. 85, no. 1, p. 1, 5. Ten Brink, U., Danforth, W., Polloni, C., Andrews, B., Llanes, P., Smith, S., Parker, E., and Uozumi, T., 2004, New seafloor map of the Puerto Rico Trench helps assess earthquake and tsunami hazards: EOS, Transactions, American Geophysical Union, v. 85, no. 37, p. 451, 354. 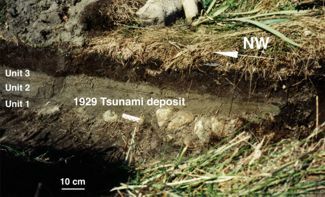 Tuttle, M.P., Ruffman, A., Anderson, T., and Jeter, H., 2004, Distinguishing tsunami from storm deposits in eastern North America: The 1929 Grand Banks tsunami versus the 1991 Halloween storm. Seismological Research Letters, v. 75, p. 117-131. U.S. Geological Survey, 2001, Earthquakes and Tsunamis in Puerto Rico and the U.S. Virgin Islands (PDF): U.S. Geological Survey, Fact Sheet FS-141-00. Ward, S.N., and Day, S., 2001, Cumbre Vieja volcano -- Potential collapse and tsunami at La Palma, Canary Islands: Geophysical Research Letters, v. 28, no. 17, p. 3397-3400. Wynn, R.M., and Masson, D.G., 2003, Canary Islands Landslides and Tsunami Generation: Can we use turbidite deposits to interpret landslide processes? (PDF), in Mienert, J., and Locat, J. (editors), Proceedings, 1st International Symposium on Submarine Mass Movements and Their Consequences: Kluwer, Dordrecht, p. 325-332. Zahibo, N., Pelinovsky, E., Kurkin, A., and Koselkov, A., 2003a, Estimation of Far-Field Tsunami Potential for the Caribbean Coast Based on Numerical Simulation (PDF): Science of Tsunami Hazards, v. 21, no. 4, p. 202-222. Zahibo, N., Pelinovsky, E., Yalciner, A., Kurkin, A., Koselkov, A., and Zaitsev, A., 2003b, The 1867 Tsunami at the Virgin Islands: Observations and Simulations (PDF): European Geophysical Society, Natural Hazards and Earth System Sciences, v. 3, p. 367-376. Originally published on the web as the January 2005 Site of the Month.